Mediterranean Villa!! 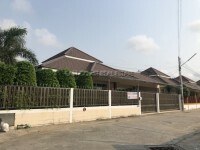 This 2 storey home is set in amongst some fantastic properties in the area of Hua Yai. The property is very picturesque on first impression but once you walk through the arched entrance doors you realise that this is a very substantial home for the money!! It comprises 3-4 bedrooms depending on how you like to configure it, there are 3 very modern and tasteful bathrooms, a fully fitted European kitchen with island, double living/dining area, various sun terraces and a lockable garage that has easy access to the house. The home is to be sold fully furnished and with full A/C. There are ample storage areas both inside and outside the home. The master walk-in wardrobes are something to behold. The garden and pool area is very well designed and functional. This home is held in Thai name and transfer costs and taxes are to be split 50/50. Living area : 345 sqm.